This week I had the pleasure of meeting an amazing group of educators. 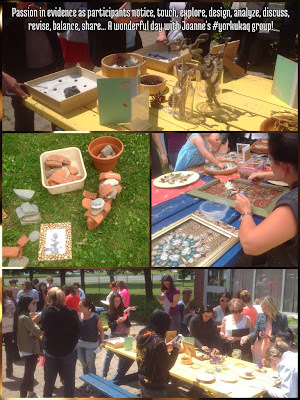 Joanne Babalis, whom I've had the pleasure of presenting "near" but never with, had invited me to share my "balance, pattern, rhythm and awe" loose parts arts workshop with her summer AQ group. I was thrilled to share what I love while working with someone for whom I have such respect. I knew it would be a big job to bring the large amount of materials I use to design the same sort of explorations students undertake in my classroom. I also knew it would be wonderful, because every opportunity I have to share my passion, I get back more in energy and fresh perspective than I bring. Being present when adults allow themselves to be free to play is one of the most rewarding experiences of my professional life. It is why I proudly say I am "Hawkins-inspired" (though that needs its own post someday). I have been sharing a version of this session for a few years (sometimes with other wondrous materials including ice and water), and it has allowed me to work with some of the very people I've long admired. I credit Serge Pascucci for helping me to discover my love of presenting, for although I've been fortunate to collaborate on wonderful workshops for our Peel (once called Kindergarten, now Early Years) Conferences, my guest visit to his Kindergarten AQ last summer was my first solo session. I was able to curate all of my favourite inspirations and materials and that day left me walking on air after seeing such a joyous and enthusiastic response by Serge's participants. That bundle (see photo below for QR code and link) has since been updated with more artists and supporting materials. Last fall, presenting with my friend Julie Metcalfe at the opening of the Hawkins Exhibit was another highlight. The whole weekend was dedicated to "messing about" with big ideas and wonder, and all participants were abuzz with the constructivist power of learning from and with materials. The only difficult part about presenting was that there were so many wonderful invitations but no time for busy presenters to truly explore them. Joanne was presenting in another section of the school (the beautiful Richland Academy) and every time I ran by and peeked in the door to say hello, there were entirely new balance creations underway. I regretted not having more time to stay and play. Naturally then, when Joanne asked if I would bring my session to her summer class, I was thrilled. And so it was, my trunk packed to overflowing, I arrived at the school anticipating a big job of lugging my goods in to set up. All images in the poster above are from classroom explorations, except for the image on the bottom left, from a video of artist Mikhail Sadovnikov at work. 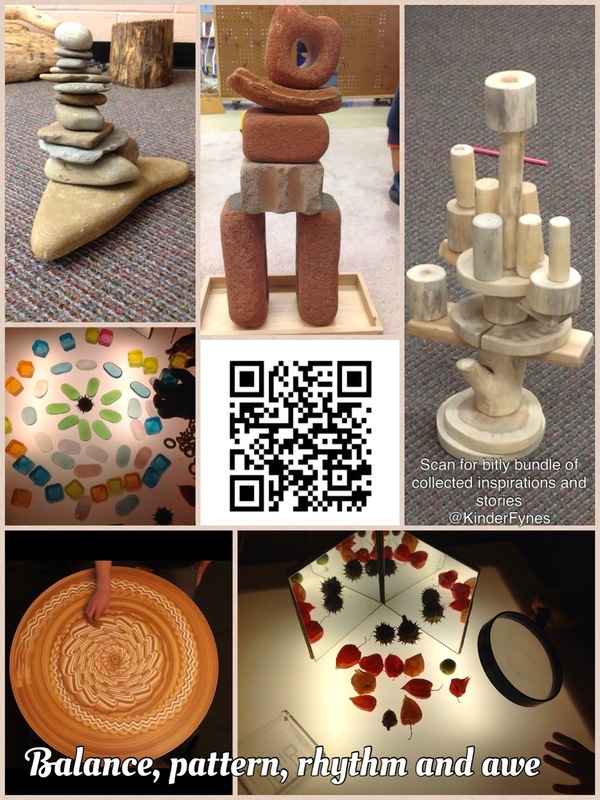 The QR code leads to this collection of supporting resource links. I walked into the learning space where class was in session, with some 45 or so participants seated at the front half of the cafetorium. The back half was filled with tables in long rows, each table covered with colourful invitations. 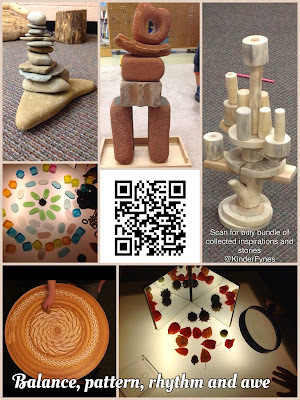 I was immediately struck by the wealth of experiences being promoted by these materials: explorations of music and sound, colour, texture, number, and more. I had a job to do but I was tempted to wander, and play. When I was spotted, I dropped my bundle and prepared to go back to my car for several trips in with my bricks and frames, books and photos, bowls and loose parts. Instead I was greeted warmly and several participants offered to help. Many hands make light work - one trip with a dolly (thanks due to the kind custodians who loaned me the dolly and opened the ramp door) and I had everything I needed. This generosity and helpfulness continued all morning, and I was struck by how beautifully the class worked together and shared their learning. It reminded my of my beloved AQ cycle which came to a close last spring when I completed my Kindergarten Specialist. I felt proud to have finished, but also heartbroken to leave the group of colleagues who had become friends. I could see that happening here, in spite of the size of the group. It is a testament to all in the class that the collaborative spirit is so strong. In spite of some minor challenges (the dropbox folder I'd created to share my students' works wouldn't open as a slideshow, then the book I'd chosen to read aloud went missing for several minutes after I'd carried it around and somehow dropped it), I was happy to hear a buzz as participants explored the visuals on display. I set out posters, books I use to invite aesthetic explorations (children's picture books and photographs of works by various artists), quotes that speak to the ideas I hope to spark, and collections of class work in documentation booklets such as our months-long inquiry my students called "all kinds of lines". 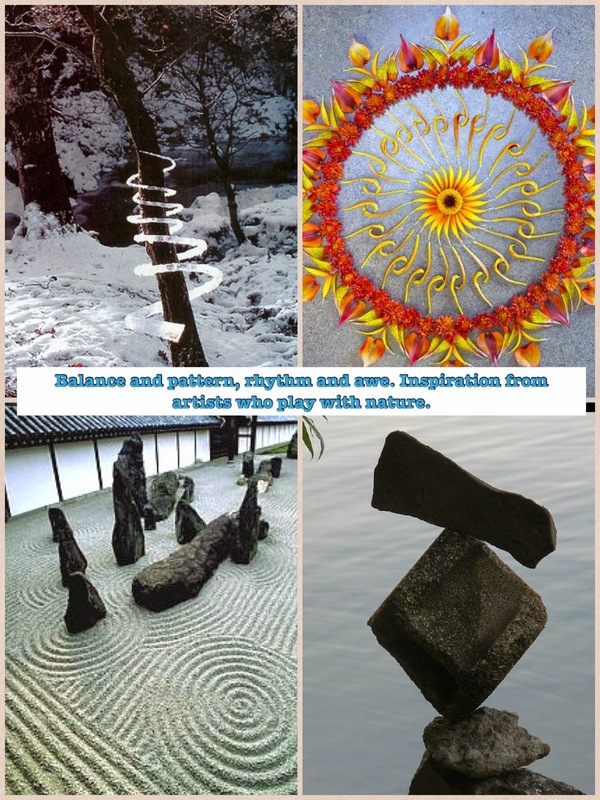 As an introduction, I shared images by favourite artists whose works involve using natural materials (stone, wood, water, flowers, leaves, clay) in startling and beautiful ways. I call the workshop "balance, pattern, rhythm and awe" (in reference to an earlier blog post) because these big ideas are found in the artists' works, and also in the way people respond and play with materials when inspired by such artwork. A collection of images by artists whose works provoke a powerful response (clockwise from top left): Andy Goldsworthy, Kathy Klein, Peter Reidel (my photo of his work), "Ursi's Eso Garden"
It is difficult to express the impact these artworks have on me. Happily, they seem to have the same impact on most people. During my introduction I listened and watched as images like the balanced stones and "danmala" flower mandala lit the screen. I heard "Ahhhh, "Wow", and even gasps. 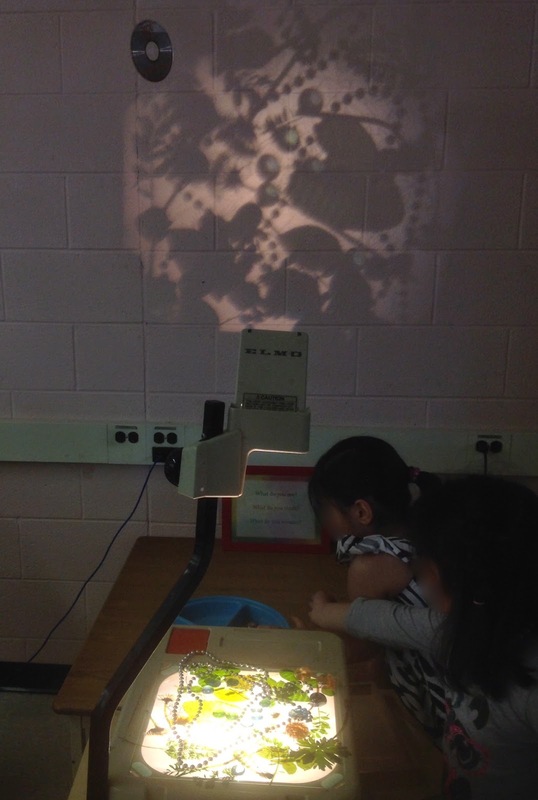 This mirrors the reaction when kindergarten students first encounter these works. These images inspire such wonder, so many observations and questions, and a desire to play with the elements of design in such a tactile way. I was hopeful that the participants would see the possibilities for exploring big ideas from all across the curriculum. After my read-aloud I invited everyone to look over the display for a few minutes while I set up the invitations in the sunny courtyard beside us. 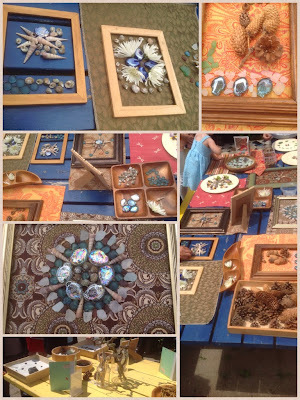 Within moments I had a gathering of helpful hands again: pouring out gems and acorns into bowl, spreading out fabric and frames, pouring sand and arranging mirrors to capture different views. And then... we played. I opened my flower press to find treasures inside for loose parts exploration. Photo courtesy of session attendee. It wasn't until later, when I was getting ready to wrap up for the day, that I saw this tweet from one of the participants. It stopped me in my tracks as I read the phrase "... art that promotes inquiry". It was the premise of my session, but I hadn't realized it was that simple. I told her I'd quote her, and indeed it became the impetus to write this post. While the ideas that wind up being explored in the classroom touch on science (balance, decay of natural materials), math (pattern, symmetry, shape, number), personal and social (self-regulation through trying again and again, persisting through failure, collaborating and sharing with different peers), physical education (body awareness of balance and control, stamina) and every aspect of the visual arts, I hadn't stopped to think about how many inquiries had spun off from these invitations. 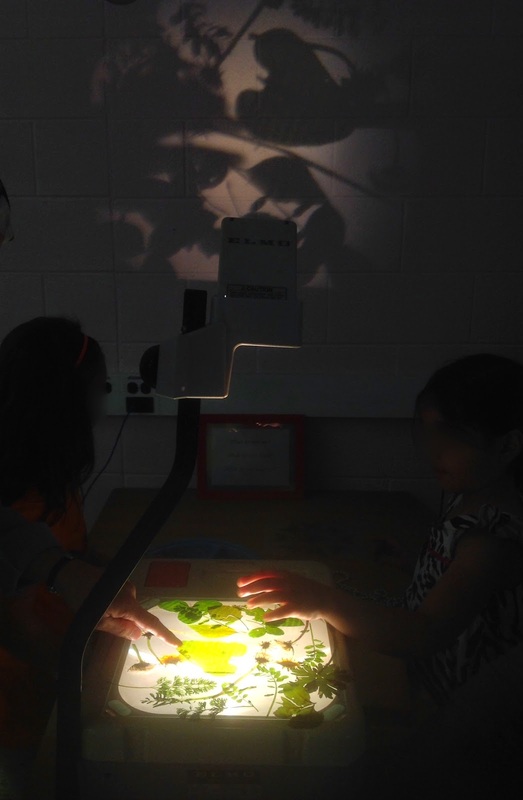 Indeed, almost every long-running inquiry in our class this year was sparked by noticings and ahas in response to provocative art, or were furthered along by including artworks that shared ideas such as the way we looked at Group of Seven landscapes over the year during our adopted-tree inquiry. We've danced to art, we've painted our feelings, and we've found line and form everywhere inside and outdoors. Writing report cards confirmed for me the tremendous learning that had gone on this year, as I pored over documentation to pull quotes for the arts section in each student's summary of progress. The rich language, clearly indicating an understanding of the elements of visual arts and music, and the deep emotional connection to certain pieces or artists all shone through in their words or creations. One question that came up several times over the course of the afternoon was a variation of "Are you an art major?" I laughed, because I was far from it. I grew up loving art (visual, music, dance) but as I got older I became aware of the "real artists" in my circle of friends. Those friends who always doodled on the margins of their papers and developed fancy ways to print their names began to intimidate me, to the point when I was in high school when I stopped drawing altogether. I continued to love art, to visit galleries in every city I visit and to enjoy all manner of works from installations to performances, gallery shows to graffiti. It wasn't until I was in teacher's college in 2002-3 that I was introduced to the works of Andy Goldsworthy that my attitude towards creating changed. I didn't have the words for it then, but suddenly I was powerfully connected to the idea of creating, not just consuming art. I felt excited about playing with art elements in nature in a way that freed me from the perfectionism that stopped me drawing and painting so many years ago. I felt free, and driven. Years later I've been inspired by great thinkers like Loris Malaguzzi and David and Frances Hawkins, who emphasize the human ingenuity that we learn through play. Thanks in large part to meeting Louise Jupp and Diane Kashin and attending the wonderful Reggio-inspired practice summer intensive, I have come to understand my practice as "Hawkins-Inspired", joyous learning. I've come to understand my love of the arts and how connecting in many of the 100 languages makes for powerful learning. A favourite quote of Suzuki Roshi which I shared at the session. Original source. Later that afternoon when I had time to catch up, I read through the tweets from many participants. It was a real gift to see through photos so many things I hadn't managed to see as I wandered around answering questions and prompting next steps. 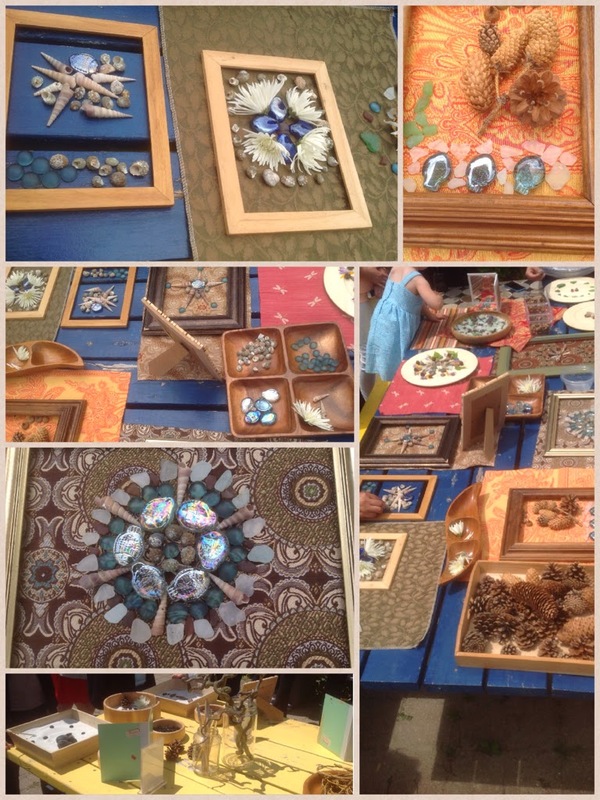 The ephemeral nature of loose parts art play means that in a moment it can all be gone. With more time to share I'd have added clipboards and pencils for participants to capture their works before tearing them down, but this tour of their photos was lovely, too. I thank these and all the participants for making their learning visible. It was a magical day, and I continue to reflect on the questions, comments, and aha's from the participants and from Joanne.